I bought these two beauties at the organic market on Thursday because–well–simply because they were so beautiful. How could you not!? I published this photo on Facebook and asked people to guess what they are. 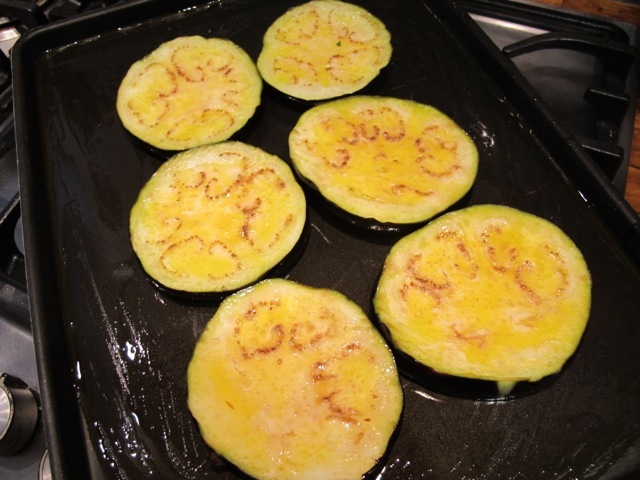 Following the photo showing how they were transformed, several readers asked for the recipe. This comes from page 24 of Delicious Dishes for Diabetics. Can be prepared ahead of time and served warm or tepid. 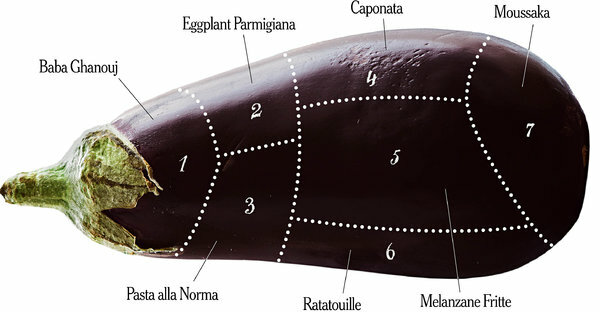 Wash and cut the aubergines into about 1.5 cm/1/2 inch slices. Dry them thoroughly and brush generously with olive oil on both sides. Heat the oven to 240°C/475°F/Gas Mark 9. Put the aubergines on a well-oiled shallow oven tray. Cook them on the top shelf of the oven for about 20 minutes until lightly browned–turning after about 10 minutes. While the aubergines are in the oven, make the sauce. Mix the crushed garlic with a tablespoon of olive oil. Combine the chopped walnuts and garlic with the parsley in a bowl and add another tablespoon or so of oil. 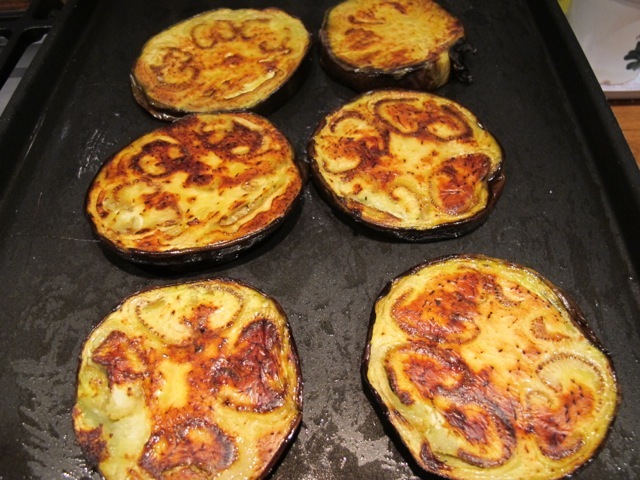 When the aubergines are nicely browned on both sides, remove from the oven. Transfer them to a serving platter, brush with vinegar, then spread the delicious sauce on top. Here’s an aubergine that thinks it’s an animal! 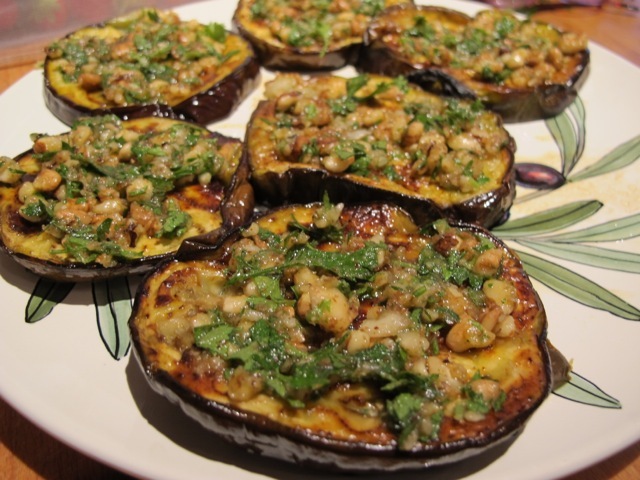 I am always looking for dishes I can prepare in advance, and using eggplant is a bonus. I don’t care for walnuts but might substitute chopped toasted pistachios. Another reminder of a gem from your cookbook–thank you. 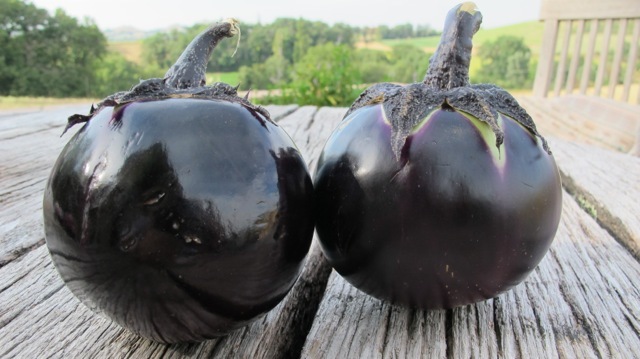 Love eggplant but not the skin; even small tender ones must be peeled. This recipe looks yummy. I made this recipe tonight and my husband and I loved the yummy results. Thanks so much for sharing this great recipe from your new book “Delicious Dishes for Diabetics.” Look forward to purchasing a copy when it is available in the U.S.
“Delicious Dishes for Diabetics” was published in the US in November 2011 and should still be available, Suzanne. The new book “Healthy Eating for Life” is due out in January 2014. 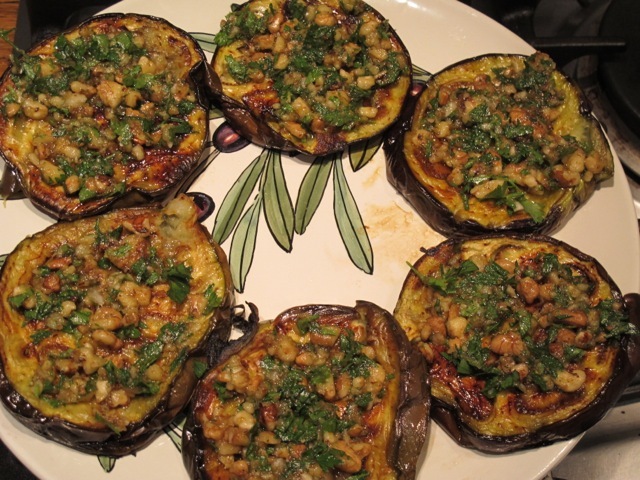 So glad you enjoyed the walnut/ aubergine recipe–we have it here regularly. Yes, your cookbook is available from Amazon here in the U.S., also in a Kindle edition which I am purchasing. When your new book “Healthy Eating for Life” is published in January, will it be available in the U.S.? Thanks! I will be watching for it on Amazon in January. Hope you have a book signing in the U.S.
A few generous friends have been giving us marrows recently. I made this tonight substituting the aubergine with thick slices of marrow. Very tasty. Thanks Robin. If you get any further inspirations on what we can do with marrow I’d be very interested. Rose Elliot’s book has some nice stuffed marrow ideas but I have more marrow now than ideas. My mother used to stuff marrows with a sort of ratatouille–though she may not have called it that. I love the Bean Book and have for years.